The $10 million Mount Tom Solar Farm with 17,208 panels will be installed by late December beside a now-closed coal-burning plant on Northampton Street with energy to power 1,000 homes, officials said Thursday. “It’s a great event. It’s a great day,” said Frank Demaille, president and CEO of ENGIE North America. 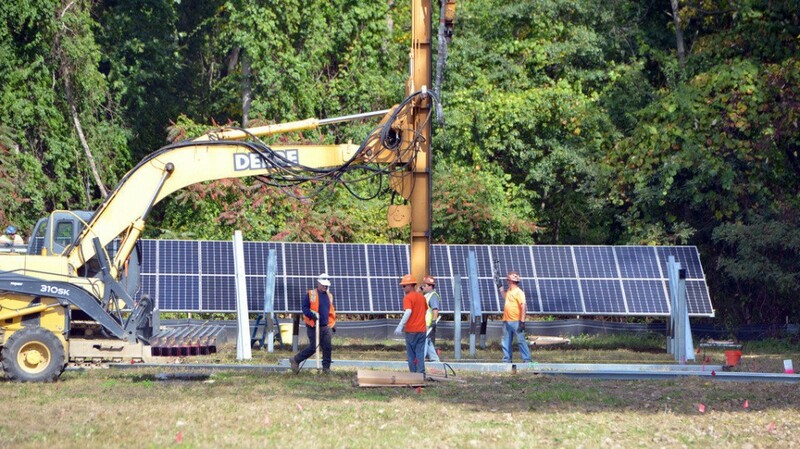 The company formerly called GDF SUEZ Energy North America held a ceremonial groundbreaking for the solar facility, which will occupy 22 acres of a 128-acre site at 200 Northampton St. beside the Connecticut River. Construction began this month, spokeswoman Julie Vitek said. GDF SUEZ shut down the coal plant in late December 2014 after years of the facility operating only sporadically. Twenty-eight employees lost jobs. Changes in energy habits led to the closing, as officials have said burning coal to produce energy was too expensive in the face of the cheaper alternative of natural gas. Demaille referred to the old-world-to-new-world transformation of the company building a solar farm in the shadow of the property’s signature smoke stack and coal-burning facility, which officials said will be demolished beginning in the spring. “It’s a landmark for us,” Demaille said. Two employees will work at the new Mount Tom Solar Farm but the facility will be run remotely by a power station in Fitchburg. The company operates solar facilities that way in Northfield, Massachusetts and Ontario, Canada, a spokeswoman said previously. ENGIE is focusing such innovation efforts on the United States and Canada — territories where it employs 3,500 people — and additional projects here are possible. The city and the Holyoke Gas and Electric Department (HGE) have proven to be good partners, Demaille said. “You have to work with the community, the mayor and his team, the local utility and his team,” he said. The 5.764 megawatts of electricity generated by the solar farm will be sold to HGE at or below market rates to ensure customers’ rates stay as low as possible, HGE Manager James M. Lavelle said. The solar farm will produce enough power to supply 1,000 homes, he said. “We’re really excited about this project …,” Lavelle said. Holyoke Mayor Alex B. Morse said decisions by legislators and work of people in the community and activists led to planning on how to deal with the demise of the coal-burning facility. State Rep. Aaron M. Vega, D-Holyoke, when he was a member of the City Council, filed an order to establish a community advisory group that began studying how the coal-burning plant property could be redeveloped, he said. Michael R. Knapik, when he was a state senator, secured $100,000 from the state to help Holyoke study reuse options for the site. That was so the city could be prepared depending on what direction the then-GDF SUEZ Energy North America was planning, he said. Morse also credited activist group Neighbor to Neighbor with keeping attention on the coal-burning plant property. “We wanted to make sure we took a pro-active stance,” Morse said. Judith Judson, commissioner of the state Department of Energy Resources, said the solar project here meets the state’s goals of providing affordable electricity; generating clean energy, that is, energy that reduces greenhouse gas emissions, which trap heat in the atmosphere; and offer a safe energy structure. “It’s really exciting to see this project,” Judson said. Members of groups like Neighbor to Neighbor and Toxics Action Center planned to celebrate the installation of the solar-power facility and its status as the replacement of the the coal-burning plant with a party after the groundbreaking ceremony at Fiesta Cafe Main Street. Neighbor to Neighbor’s Lena Entin addressed concerns that such a party could be seen as insensitive to coal-plant workers who lost jobs. The group’s focus was the breathing and other health problems from exposure to coal-burning and always included calls for the employees to receive training for other positions and strong severance packages, she said. “We are celebrating that we’re moving from burning coal, which contributes to asthma and respiratory problems and even early death, to clean energy. We too are devastated about the job losses,” Entin said. The reason the Mount Tom Solar Farm will be subject to a PILOT instead of straight taxation is related to the solar component. The solar panels, like other equipment on a business property (merchandise, furnishings, tools, animals, equipment), would be subject to taxation as personal property under state tax laws, said Marcos A. Marrero, director of the city Department of Planning and Economic Development. The issue with solar equipment is, at the outset, it is valued so high that the tax bill the first few years can kill a solar project. But solar equipment depreciates quickly, so taxable income from the city’s perspective would be very low after only a few years. So establishing a PILOT of $5,000 per megawatt ensures a steady tax revenue for the city from such a business, he said. The shuttering of the coal-burning plant was a blow to the municipal budget of this city, which has nearly a third of its population of 40,000 living below the federal poverty line. For decades, the city could count on more than $600,000 in property tax revenue from the coal plant. Limits on what future development could occupy the site left few options, said officials such as Marrero who studied possibilities. Site restrictions included its high risk for flooding, being adjacent to the river, presence of endangered species and government regulations.